Founded by Robert Bosch in 1886, Robert Bosch GmbH is the leading supplier of automotive parts in the world. Better known simply as Bosch, the company also makes building supplies, and industrial products. Bosch is generally accepted as making the first commercially viable spark plug in 1902, and had a patent for one in 1898. Bosch currently owns 440 subsidiaries, in addition to the auto parts business. Bosch in Mexico has 3 different locations, the first in Mexico City, the second in Mexicali, and the third in Juarez. There are also a number of mechanics operating under the Bosch name. Recently, the company celebrated the 20th Anniversary of making platinum spark plugs in Mexico. To commemorate the event, the company had this cotton jumpsuit was made. The suit shows no real use, and is in great condition. 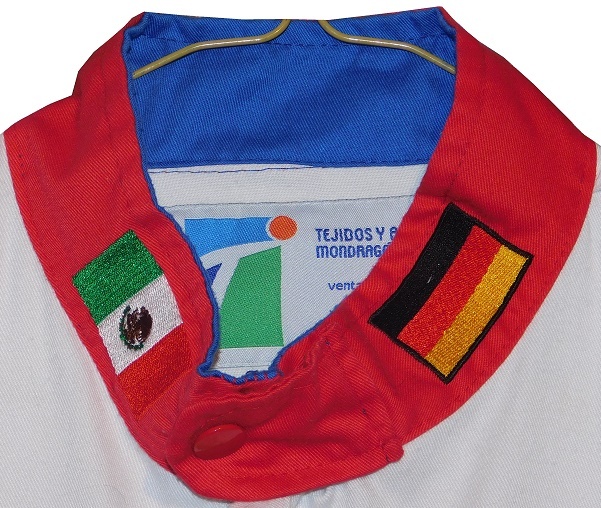 The collar has a button snap, with a Mexican flag on the right side, and a German flag on the left. 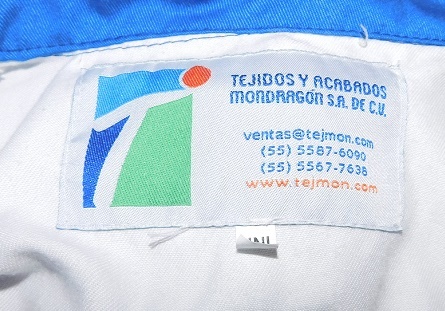 The suit is made by Tejidos y Acabados Industriales S.A. de C.V.. Their manufacturer tag is located in the cowl. 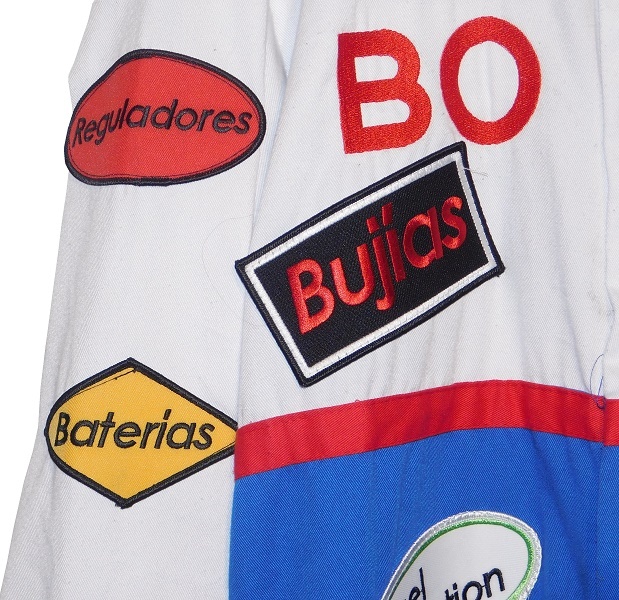 The chest has a large BOSCH logo, and four patches, which read BUJIAS which translates to plugs, FRENOS which translates to brakes, ALTERNADORES which translates to Alternators, and for some reason, FUEL INJECTORS in English, which would translate to inyectores de combustible in Spanish. The suit has no belt The blue legs have white pockets with red closures on them. 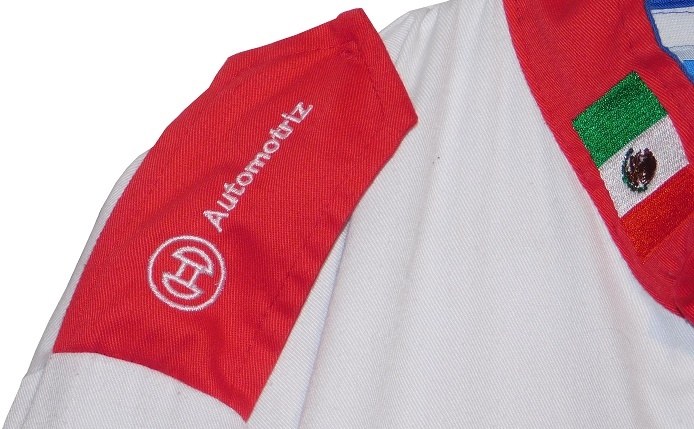 The shoulders have red epaulets, with Robert Bosch GmbH logos and AUTOMOTRIZ, which is Spanish for automotive. The sleeves have patches. 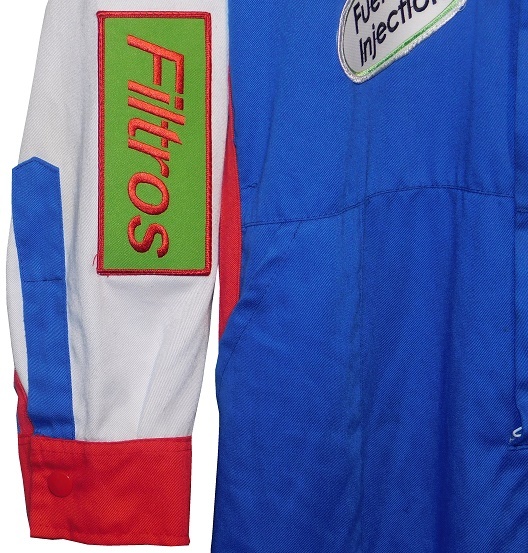 On the right sleeve, the upper patches have REGULADORES which translates to regulators, and BATERIAS which translates to batteries, and the lower sleeve has FILTROS which translates to filters in television position. 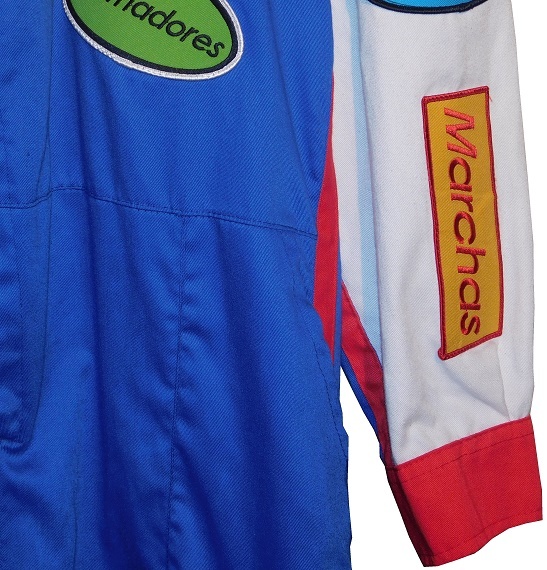 The left sleeve has a black patch, with a spark plug design with 20 ANOS DE BUJAIS DE PLANTO embroidered into it. 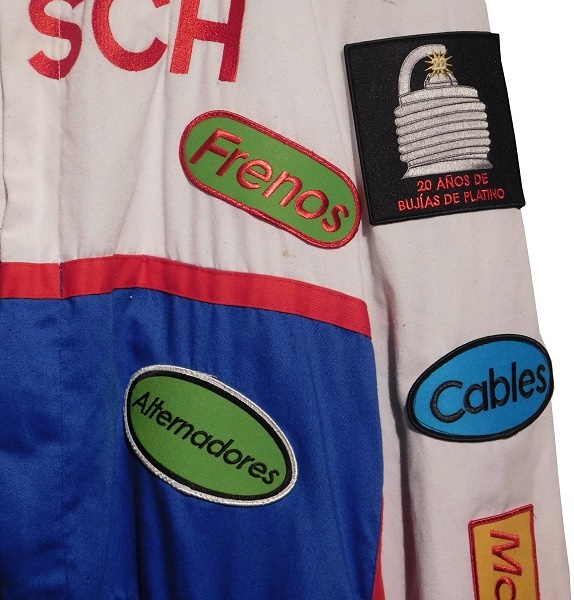 That translates to “20 years of platinum sparks.” There is a second patch with CABLES,and a third patch, with MARCHAS, which translates to Marches, which is an automotive term in Mexico. 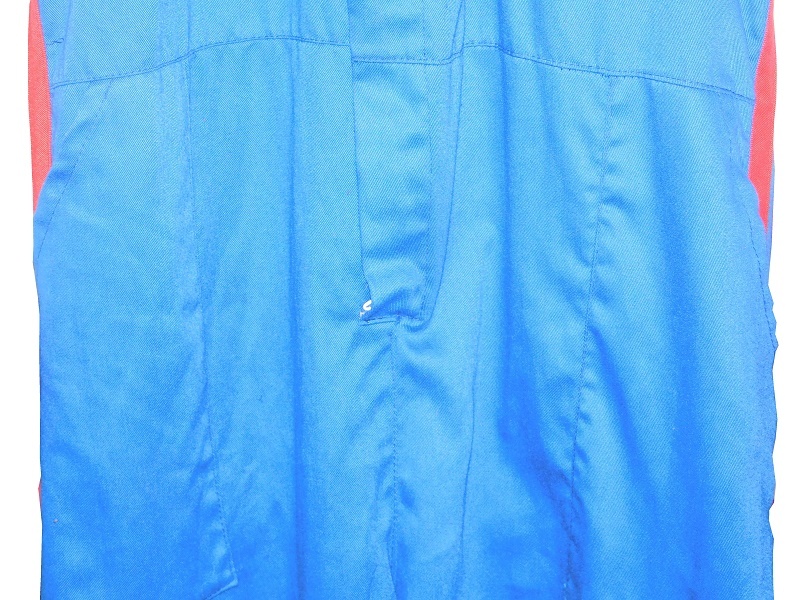 The back of the suit shows no wear. The neck is in red fabric and has no adornment on the back of the neck. 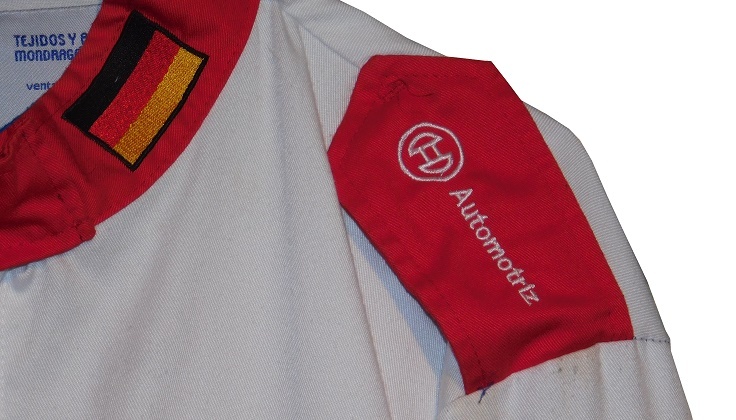 The back torso has a BOSCH RACING TEAM logo embroidered into it. Bosch continues to be a force in automotive, industrial and home improvement technology. Being the largest auto part company, and a major supplier of industrial equipment and power tools, they are invested in most industries in the world. They are a well-known sponsor of auto racing as well, sponsoring events and cars. Next week, I’ll discuss some IndyCar race-worn boots.